1. Where’s the Beef? Or rather, where does it come from? If they don’t say, you can only assume it’s Sysco or some other food-service mill. The producers I hold in the highest esteem are, in order, Snake River Farms, Creekstone, Strube Ranch and Meyer. (Disclosure: Creekstone was a beef sponsor for my meat festival.) A brand label doesn’t guarantee a great steak, but it’s a start. 2. The Rule of 100. A steak house that has 300 seats might feed 1,000 people a day—more if they serve lunch, more still if it’s a Friday or a Saturday. 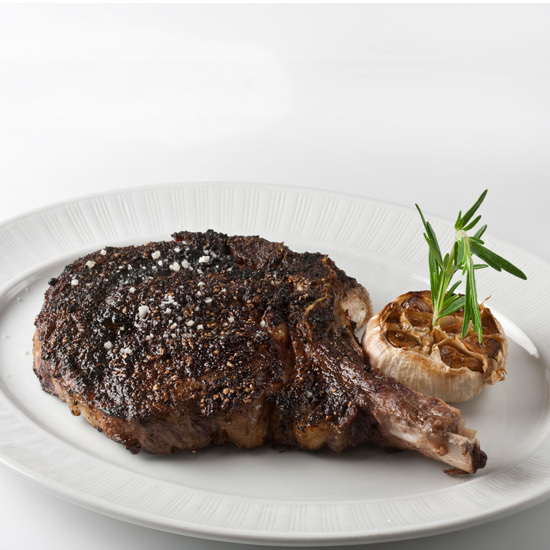 How many restaurants do you think get 1,000 perfect, dry-aged, USDA prime steaks at a time? Here is the answer: none. You are better served going to a steak house with 100 seats, a head count that will give you a fighting chance at the steak you deserve. 3. Busy is Better. That said, restaurants that are busy get a lot of turnover, which means that more steak goes through the kitchen, which means that it is fresher. And freshness matters. You can keep a steak in an aging room for weeks, but once it’s cut up, the same thing happens to it in the restaurant’s refrigerator that happens in your refrigerator. The only difference is that the guy who bought it doesn’t have to eat it, and is losing money when he or she throws it away. You can see where I’m going with this. It’s not enough for a place to have great steaks. They don’t stay great for long. 4. You’re Rolling the Dice Outside New York, L.A., or Vegas. I know this is going to piss a lot of people off. But it’s true. There was never a lot of prime beef in this country, never enough to go around, and the situation has gotten worse—much worse. First came a huge boom in the number of high-end steak houses: Remember when there was only three or four in your town? Now there are a dozen, half of which are chains (more on this later). Then, as the luxury meat market globalized, rich people in Asia and Europe began to clamor for the best stuff, and started getting it. The Internet came along, and big purveyors like the Allen Brothers in Chicago and Pat LaFrieda and Lobel’s in New York started selling steaks online that formerly went to only the top retail butchers. Factor in the military, which buys more prime beef than any steak house or grocery chain ever could, and you have a recipe for a shortage. So who gets it? The places that pay the most, which means the places that charge the most. The majority of these places are in New York, which is where the money is. I know Chicago has a lot of money, and loves its meat, but for whatever reason I’ve never gotten true prime in a Chicago steak house. I’m sorry. 5. Break the Chains. Because so many cities are so grossly underserved when it comes to steak, a handful of high-end steak chains have made hay in cities like Atlanta, Cincinnati, Providence and even Kansas City—the home of steak! They’re all basically the same restaurant, with the same menu and the same expense-account clientele. They are usually pretty good, too, and a good bet if there’s nothing better. But the truly great steak houses have been around for generations, and have relationships with butchers who have also been around for generations and who cherry-pick the best of the best for them. High-end steak chains buy meat the way Costco does. There’s no guy looking at every steak that comes in. On the other hand, they do buy a lot of meat, and volume buyers typically get first pick, so you are unlikely to get a bad steak there. Basically, you are buying a Camry: a good, reliable, well-made vehicle, but not one to be confused with a BMW. 6. Beware of Sock Puppets. A lot of us, including me, tend to look at Yelp or other review sites when deciding on a restaurant. I don’t know if this is a good idea with a high-stakes game like picking a steak house. The perils include “sock puppets,” i.e. owners who write their own reviews; extortion on the part of some sites—never proved, but frequently claimed by restaurant owners; and, most insidious of all, people who don’t go to a lot of steak houses. These reviewers are too easily pleased by big, good-looking plates of steak covered in butter. 7. Turn Off the Gas. Steak is meant to be cooked over wood, or at least wood embers. Period. Gas is good for heating rooms, but if it has any taste at all, it’s a bad one. Whereas wood always tastes good, and sometimes tastes great. I would rather have a “high choice” product cooked over hickory or mesquite than a prime steak cooked over what amounts to a giant cigarette lighter. Broilers are better, since they cook hotter and since the gas fumes go away from the steak, but there is no substitute for wood. Josh Ozersky has written on his carnivorous exploits for Time, Esquire and New York magazines; he has authored several books, including The Hamburger: A History; and he is the founder of the Meatopia food festival (which has an event this weekend in New York). Related: Best Steak in the U.S.